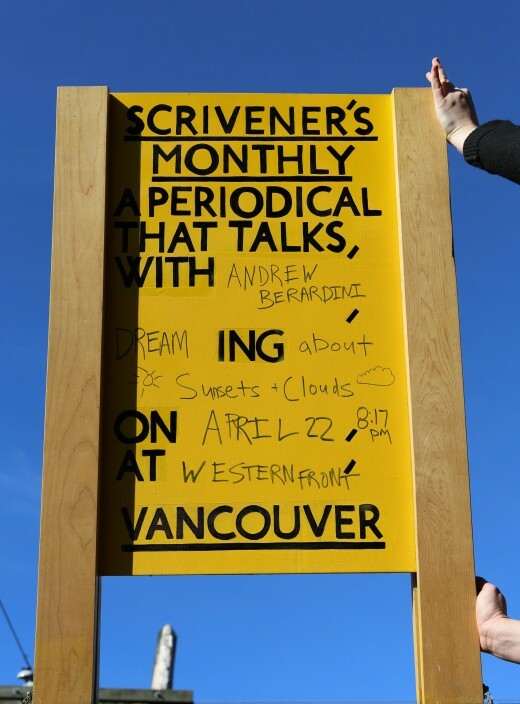 A curl of hair or a milky veil, ice-cream orgies and champagne supernovas, Los Angeles-based writer Andrew Berardini will read a few words about the varieties of clouds and how to look at sunsets. Andrew Berardini. A writer between essay and poetry, occasional editor and curator of art. Teacher at the artist-run Mountain School of Arts. Art Book Review co-founder. Los Angeles Editor for Mousse and Contributing Editor to Art-Agenda and Momus. Warhol/Creative Capital Art Writer and 221A Curatorial Resident Co-Grantee. Author of the memoirish ​​Danh Vo: Relics (Mousse, 2015) and a perennially in-progres​s book about color​. With poet Quinn Latimer, faculty in Spring 2016 for a residency on art writing as literature at the Banff Centre.